In the past I’ve been unsuccessful in remaining faithful to my journaling efforts. I did manage one NaNo challenge! Part of the problem arises when I ‘get lost’ in the journal pages and spent too much time doing them and part arises from frustration with bound journal pages. So I’m trying a new approach. I also want to explore ‘tangles’ this year and have prepared to do so by making my own tangle ’tiles’ from 110 lb card stock purchased by the pack at my local office supply store. I needed it for another project so had it on hand. Once the squares were cut, I rounded the corners with a new corner punch purchased at half price at the local craft store. Tangle tiles are 3.5 inches squares so if I use the back of my practice tiles, I’ve been successful in limiting the size of my journal ‘page’. I’ll share my practice tangles later. 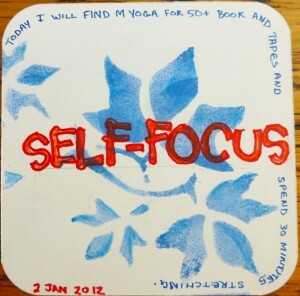 For journal prompts, I am using Dale Anne Potter’s daily prompts – one word that I can react to spontaneously. When you sign up for her newsletter, you can choose to receive some extras, like the prompts. I’ve now done two and spent a max of 15 minutes each time. I shared my January 1 journal ‘page’ yesterday and here is today’s. …. and yes I did go back and add the missing ‘y’!